I have an 1989 Class A motorhome. 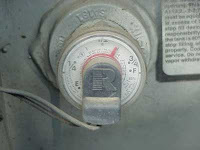 The indicator lights for the propane level always register full. The unit worked fine until about a few months ago. Is there a way to reset this or do I have to replace the sender unit? How does that work? Brian, the LP sending unit assembly is attached directly to the horizontal LP container. The mechanical float assembly is situated inside the container and corresponds with the sending unit/gauge which is secured on the outside of the container. The float assembly activates a magnet positioned at the rear of the gauge. The magnet actually moves the needle on the gauge which in turn "sends" the corresponding electrical signal to the monitor panel. It could be the gauge unit is faulty and is stuck on "full" in which case it will have to be replaced. In some instances, depending on the maker of the monitor panel, a constant "full" indication means the wire to the monitor panel is shorted to ground. On some panels, it could mean there is an electrical "open" in that circuit; the wire is broken somewhere between the gauge on the container and the monitor panel.